Anytime you travel on airlines you run the risk of losing your luggage. It’s happened to me 5 or 6 times and each and everytime it is an absolute hassle. A couple times they simply could not locate my luggage so I actually lost everything inside. But nowadays you can actually track your luggage using GPS. That’s right, you can basically attach a tracking device to your bag and always know exactly where you bag is. So if you tend to travel with stuff that you couldn’t live with losing at the airport, then consider checking out our pick for the best luggage GPS tracker below. The Trakdot is able to to locate your luggage worldwide, sending you phone notifications when you bag arrives at your location. The GPS receiver on this unit is able to actually track your bag through various containers so you will almost always be able to find out which city your bag is in. The unit technically uses GSM mobile signals as opposed to GPS to locate your bag. This is much more reliable than GPS since it doesn’t need to have line of sight into the sky. So the GSM connection is what allows you to find out where in the world your bag is. But the unit also integrates a Bluetooth connection which allows you to pinpoint your luggage on the arrivals baggage claim within 30 feet! This is truly awesome. 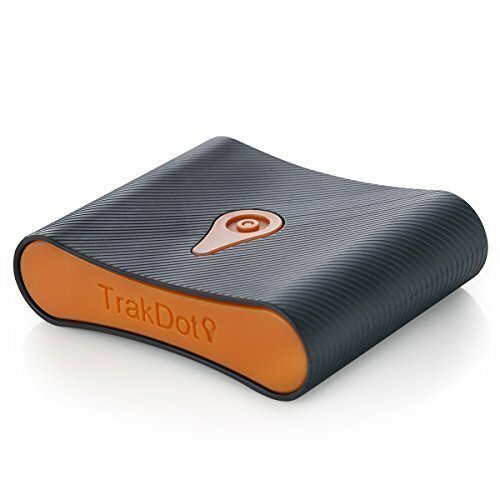 Operating on 2 AA batteries, the Trakdot is our pick for the best luggage tracker out there. If you aren’t interested in a separate device for tracking your bag, then consider the BlueSmart bag which includes an integrated GPS/GSM tracker. REST EASY: Trakdot's patented GSM based smart technology is both FCC Certified and FAA compliant.